Sub-mitral aneurysms are rarely reported. Congenital weakness of the mitral annulus in relation to posterior mitral leaflet is currently accepted as the most likely etiology. Although these aneurysms were predominantly reported from Africa, many have been reported from other areas of the world also. Clinical manifestations vary from asymptomatic to severe mitral regurgitation causing ventricular failure, sustained ventricular tachycardia, thromboembolism, or ischemic manifestations due to circumflex artery compression. We report a case of sub-mitral aneurysm in a 17-year-old boy diagnosed through echocardiography. A 17-year-old boy presented with complaints of progressive dyspnea on exertion and palpitation for 2 years. There was no history of paroxysmal nocturnal dyspnea/ orthopnea/ or pedal edema. There was no prior history of fever or prolonged hospitalization. Jugular venous pressure was not elevated. Cardiovascular examination revealed a precordial bulge with a hyperdynamic apex displaced laterally. Systolic thrill at apex and left parasternal heave were appreciated. A muffled first heart sound and a pansystolic murmur of grade 4/6 at the apex radiating to the axilla were auscultated. Rest of the systemic examination was unremarkable, and pre-operative blood investigations were normal. Chest X-ray showed enlargement of left atrium and ventricle and signs of pulmonary venous as well as pulmonary arterial hypertension. A 2D echocardiogram showed minimally thickened mitral valve leaflets with severe eccentric mitral regurgitation. Sub-valvular apparatus was free of disease. 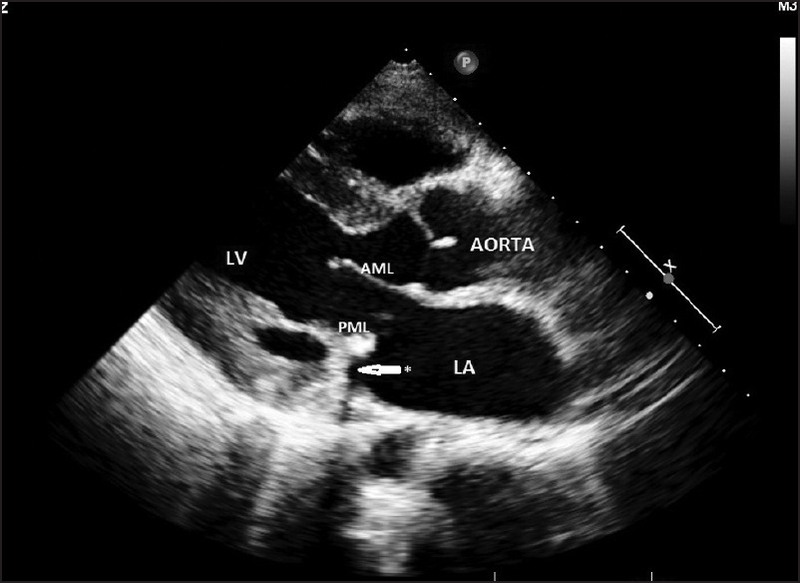 A sub-mitral aneurysm was detected and seen to be communicating with the left atrium. Aortic valve was thickened with mild regurgitation. There was mild left ventricular systolic dysfunction (ejection fraction 50%). Per-operative trans-esophageal echocardiography showed a sub-mitral aneurysm related to the posterior mitral annulus [Figure 1] causing eccentric mitral regurgitation [Figure 2]. Aortic valve leaflets were normal with mild regurgitation. Median sternotomy exposed an enlarged heart. The procedure was carried out under mild hypothermic cardiopulmonary bypass with cold blood cardioplegic arrest. The left atrium was opened, and mitral valve leaflets were found to be pliable. A sub-mitral aneurysm was identified in relation to the p2/p3 segments of the posterior annulus. Further delineation of the anatomy revealed a second aneurysm close to the posterior annulus at the p1/p2 junction [Figure 3]. First aneurysm sac was 4 × 4 cm with a narrow neck, while the second had a wider neck with a smaller sac. 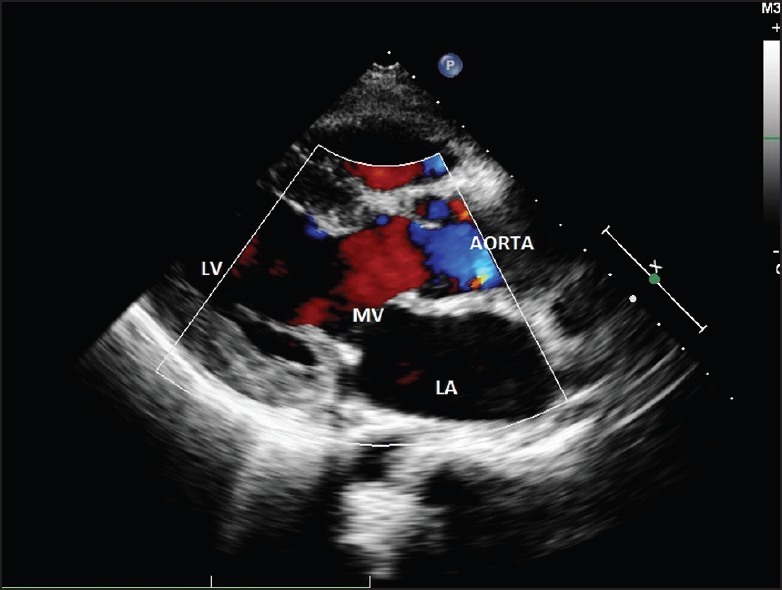 Left atrial appendage was clear; saline test demonstrated severe eccentric mitral regurgitation. The first aneurysmal sac was repaired with pledgeted interrupted monofilament polypropylene sutures passing through the left ventricular side of the aneurysm, the posterior mitral annulus, and the neck thereby obliterating it, and the excess sac was excised. The second aneurysm's neck was plicated with pledgeted polypropylene sutures passing through the neck and the annulus. Additional sutures were passed through the mitral annulus and the sac thereby plicating it, simultaneously strengthening that portion of the mitral annulus [Figure 4]. Saline test showed mild eccentric regurgitation jet through the posteromedial commissure. 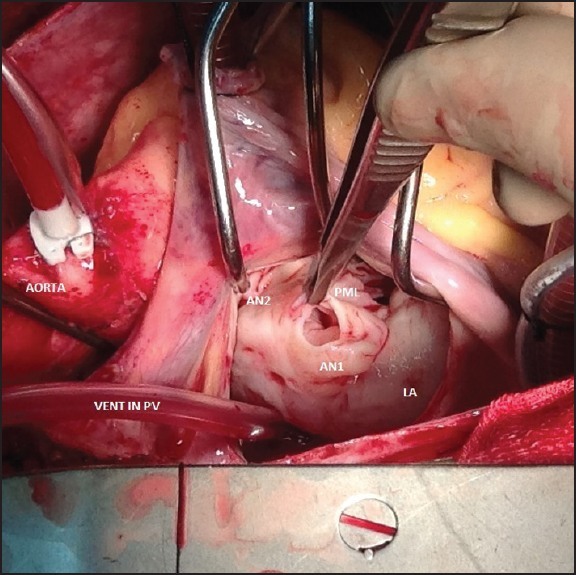 Posterior mitral annuloplasty was performed with a hard polytetrafluoroethylene (PTFE) felt providing a fully competent valve [Figure 5]. Post-operative 2D echocardiography showed a competent mitral valve with no residual aneurysm or regurgitation [Figure 6] and [Figure 7]. Bacteriological culture of the aneurysmal wall was reported positive for Staphylococcus aureus although histopathology suggested a congenital etiology. In spite of blood culture being sterile, he received 4 weeks of antibiotics since Staphylococcus could be a potential pathogen. Sub-mitral aneurysms are thought to arise due to congenital weakness in the area between cardiac muscle and fibrous structure of the heart. Enlargement of the aneurysm leads to distortion of mitral apparatus or compression of adjacent structures, leading to the clinical manifestations. A 2D echocardiography can very well diagnose this condition although coronary angiography may be required if presenting with ischemic manifestations of circumflex artery compression. According to the classification proposed by Toit,  our case is type II sub mitral aneurysm with 2 necks both of which were addressed intraoperatively. Trans-esophageal echocardiography could identify only a single aneurysm. Hence, a thorough assessment of the anatomy before repair is essential to avoid residual aneurysm due to unrecognized neck. The surgical approach can vary depending on its size, extent, and position. Extreme care should be taken not to jeopardize the circumflex artery, which is closely related to the neck. 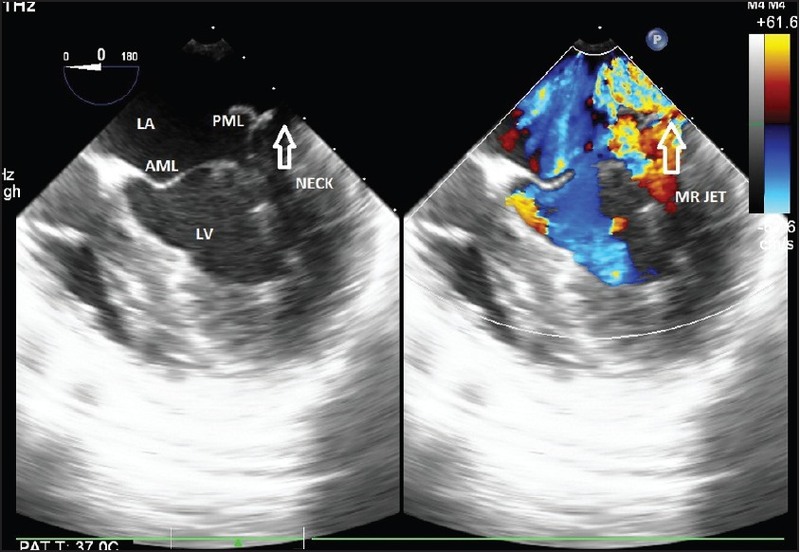 As mitral regurgitation is the most common presentation, mitral valve repair should be added to have a good post-operative outcome, which depends on the extent of posterior mitral annulus involvement. Mitral valve replacement may be required if the whole posterior annulus  is involved. 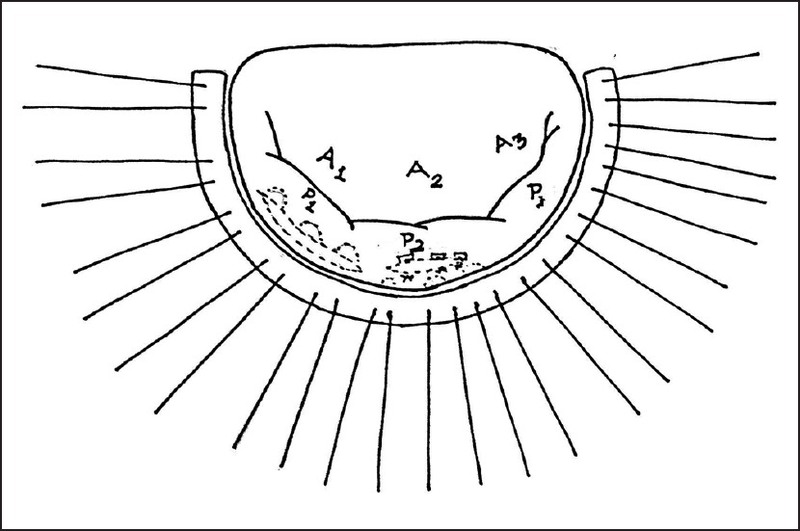 In our case, plication sutures of the aneurysmal sac were passed through the annulus to strengthen it. In large neck, patch closure  is performed to avoid the distortion of the mitral annulus to avoid residual regurgitation. Apart from dealing with both the aneurysms independently, posterior annuloplasty had to be added to provide a competent mitral valve. Although the aneurysm is thought to be congenital, association with Takayasu arteritis,  rheumatic heart disease, and tuberculosis  have been reported. 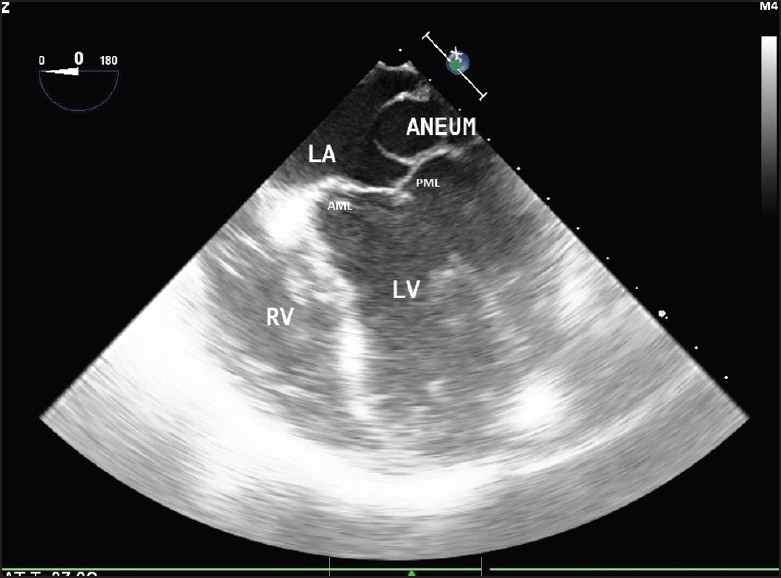 Infected left ventricular pseudoaneurysms are reported after mitral valve infective endocarditis. But, infected true aneurysms of the mitral valve are reported mostly related to the anterior mitral leaflet after aortic valve infective endocarditis . An infected sub-mitral aneurysm close to posterior mitral leaflet, without any documented infective endocarditis as in this case, is a rare occurrence and has been reported by Kim et al. Since natural history is unfavorable in view of progression to ventricular dysfunction, sustained arrhythmia,  thromboembolism, and ischemia, surgical intervention should be undertaken after a definitive diagnosis. Although timely surgical intervention provides excellent results, outcome can be grave in those with large aneurysms and severe ventricular dysfunction. Sub-mitral aneurysms are amenable to surgical correction providing satisfactory results. Attempt to identify multiple necks and addition of mitral valve repair procedure is recommended for a complete repair. The aneurysmal sac should also be subjected to histopathological and bacteriological analysis. 1. Chessler E, Joffe N. Annular subvalvular left ventricular aneurysms in the South African Banthu. Circulation 1965;32:43-51. 2. Mohan JC, Goel PK, Khanna SK, Arora R. Massive congenital submitral aneurysm of the left ventricle: A case report. Indian Heart J 1989;41:338-40. 3. Du Toit HJ, Von Oppell UO, Hewitson J, Lawrenson J, Davies J. Left ventricular sub-valvar mitral aneurysms. Interact Cardiovasc Thorac Surg 2003;2:547-51. 4. Purushotham S, Manohar SR, Sivasubramaniam S, Neelakandhan KS. Sub mitral left ventricular aneurysm: The location of the circumflex coronary artery influences the surgical approach and outcome. J Thorac Cardiovasc Surg 2005;129:1175-7. 5. Zisbrod Z, Manjoney DL, Tranbaugh RF, Cunningham JN Jr. Successful repair of a submitral left ventricular infected pseudoaneurysm. Ann Thorac Surg 1991;52:304-5. 6. Gao C, Xiao C, Bojun L. Mitral valve aneurysm with infective endocarditis. Ann Thorac Surg 2004;78:2171-3. 7. Kim DJ, Cho KJ, Jun HJ, Kim YJ, Song YJ, Jhi JH, et al. 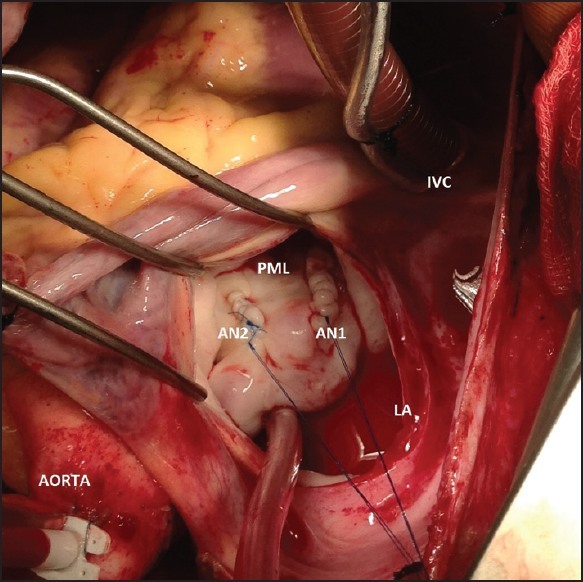 Perforated mitral valve aneurysmin the posterior leaflet without infective endocarditis. J Cardiovasc Ultrasound 2012;20:100-2. 8. Kazemi B, Arya A, Haghjoo M, Ali M, Sadir-Ameli MA. Idiopathic Submitral Left Ventricular Aneurysm: An unusual substrate for ventricular tachycardia in Caucasians. Indian Pacing Electrophysiol J 2005;5:244-9.